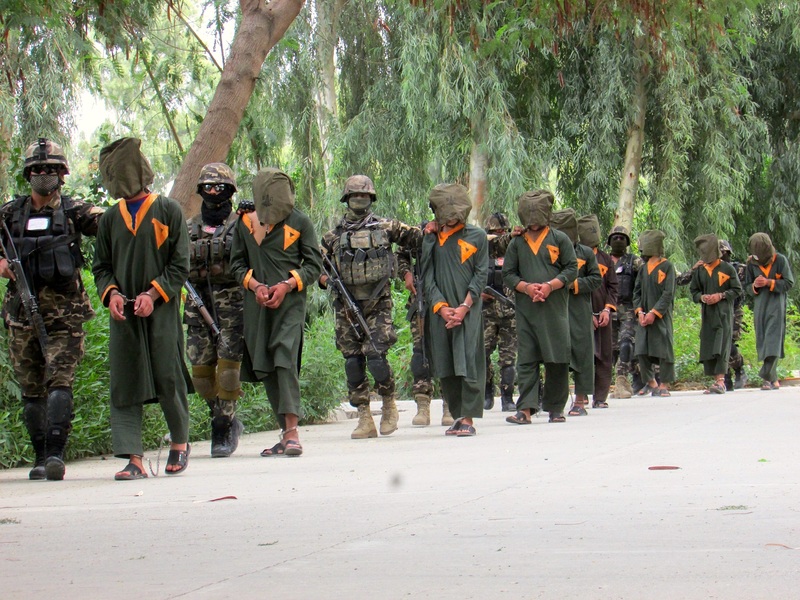 JALALABAD -- National Directorate of Security (NDS) personnel in Nangarhar Province over the past week arrested six accused "Islamic State of Iraq and Syria" (ISIS) and Taliban fighters, including a suspected would-be suicide bomber. 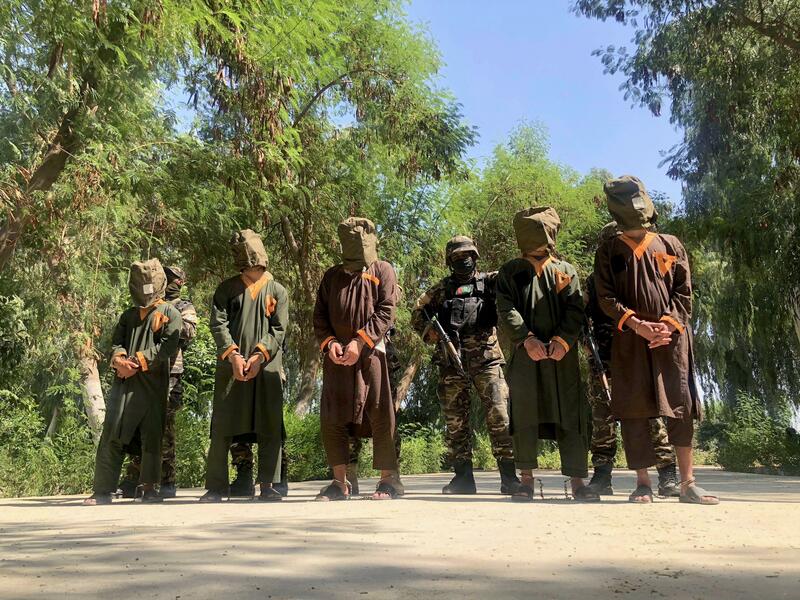 Three of the detainees -- identified as two ISIS and one Taliban -- were presented by Afghan authorities to the media on Monday (August 27) at the NDS facility in Jalalabad. NDS forces captured the men during routine operations, Ataullah Khogyani, spokesman for the Nangarhar governor, said, adding that the six included four Taliban members and two ISIS members. One of the prisoners is "a teenager and resident of Nazyan District, who was trained by ... the Lashkar-e-Islam militant group to conduct a suicide bombing," he said, referring to one of the accused Taliban members. "The others are Saifullah of Pakistan, Kiramat Shah of Haska Mina District in Nangarhar, Herat Khan of Khogyani District and Juma Gul of Qarghayi District, Laghman Province," he said. The suspects confessed in a videotape that NDS made available to media. "It has been about four years since I first joined Abdul Haq's group of [ISIS]," said Atiqullah, one suspect in the video, referring to a local ISIS commander. "I fought the [Afghan] government... for the past few years, but I regret my actions now that I am captured," he said. The arrests came after a joint air strike by Afghan and coalition forces August 25 in Khogyani District killed Abu Saad Arhabi, the chief of ISIS in Afghanistan, alongside 10 other terrorists. 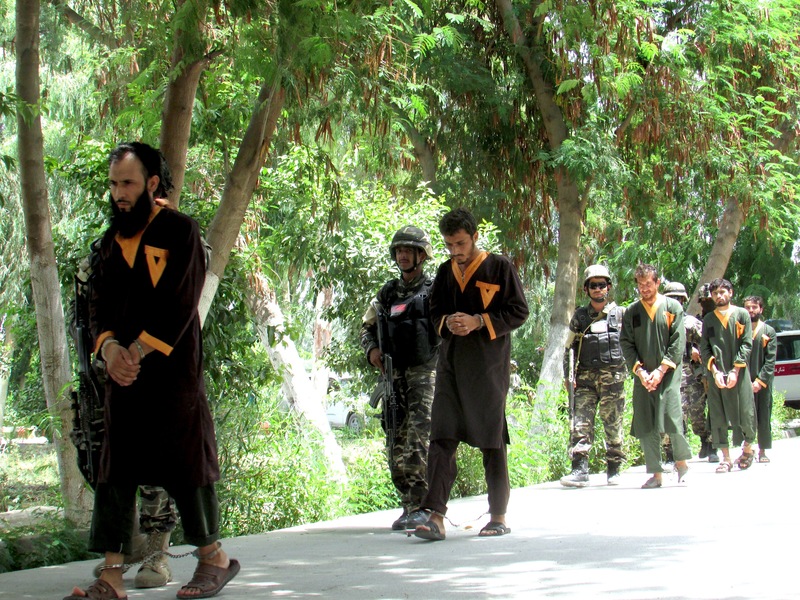 On Wednesday (August 29), NDS personnel arrested four ISIS members in Kabul who were posing as taxi drivers and using their vehicles to transport weapons and militants to Kabul and other provinces, TOLONews reported. In the past year, ISIS has suffered significant setbacks in Afghanistan. More than 150 of its members surrendered to Afghan forces in Jawzjan in early August. Afghan and coalition forces have killed three of its leaders in Afghanistan since April, including Arhabi. "ISIS has been defeated in Nangarhar," said Nangarhar Governor Hayatullah Hayat at an August 16 news conference. "The Taliban, including the group's Red Unit [special forces], had been fighting ISIS in the Wazir Valley in Khogyani District," said Hayat at the time. "Taking advantage of the opportunity, we [Afghan and coalition forces] launched air and ground operations against both groups." "We and [coalition] forces together eradicated the roots of ISIS, and whoever is left of them will be killed or arrested," he added. "The cruelties committed by ISIS in Shinwar, Achin, Pacheragam and other districts are unimaginable and unacceptable to anyone," Sulaiman, 33, a resident of the Zaway area in Khogyani District, told Salaam Times. "We do not want ISIS and support our own government and pray for its victory," he added. "ISIS set our house on fire, and now we don't have a home," Sayed Qayum, 28, of the Asad Khil Valley in Achin District, told Salaam Times. "We live in strangers' homes. It killed civilians and is still doing it." "How can I ignore its cruelties?" he asked. Local officials presented the detainees, along with four Taliban members, to the media at the National Directorate of Security provincial compound in Jalalabad. The two ISIS leaders allegedly were responsible for providing explosives, suicide vests and the transportation of ISIS family members throughout the province.